SUPPORTING ENDANGERED ELEPHANTS: Every Ugly Elephant Product Purchased, we donate a portion to the Elephant Conservation Fund named Space for Giants. They focus on the preservation and healing of these animals from poaching and other related incidents. STYLISH AND HIGH QUALITY: The Ugly Elephant Company Baby Diaper Caddy is built to withstand the wear and tear of a child growing up, with a strong, breathable and ultra-soft fabric that you would expect from our brand. Made from high polyester felt, this basket will last you a long time. As the lightweight, ultra-soft felt provides comfort, the reinforced walls provided durability and long-term usage. LARGE FOR ALL DIAPER SIZES & VERSATILE DESIGN:: The Perfect size for keeping all your baby's essentials with you at ALL times such as diapers, wipes, burp cloths, onesies, baby toys, pacifier binky, teeters, books, creams and much, much more! MULTI PURPOSE: From organizing the nursery room, traveling, bathing by the pool or taking the kids to practice, this tote is perfect for all occasions. It also serves as an arts & crafts bag, breast pump basket, toy organizer and anything else that could come your way. Our platinum gray and baby blue colorway can be used for an assortment of activities! PERFECT FOR BABY SHOWER: Give the BEST present at the baby shower with your baby basket. Fill it with diapers, onesies, blankets, and watch as you'll be the talk of the shower. 100% SATISFACTION GUARANTEED - We know you'll love our baby basket as much as we do. In fact, if for any reason you're not completely satisfied, just return your basket within 30 days we'll issue a full refund. We know how busy raising a newborn can be, and that's why we want to make your life THAT MUCH EASIER. ❤ STYLISH WITH FREE SUNGLASSES CASE- Perfect for any nursery, this baby diaper caddy organizer keeps all your baby's essentials with you at ALL times! Designed with a strong, breathable fabric that you should expect! Along with a FREE felt sunglasses case with a oak brown lacing at no extra cost! ❤ SAVING THE ELEPHANTS WITH EVERY PURCHASE - We will be donating a portion of every sale to the Elephant Conservation Area, which focuses on the preservation and healing of these animals from poaching and other related incidents. ❤ NEW LARGER DESIGN- This new modern size allows you to carry all your baby's necessities and never have worries about leaving ANYTHING behind wherever you go! 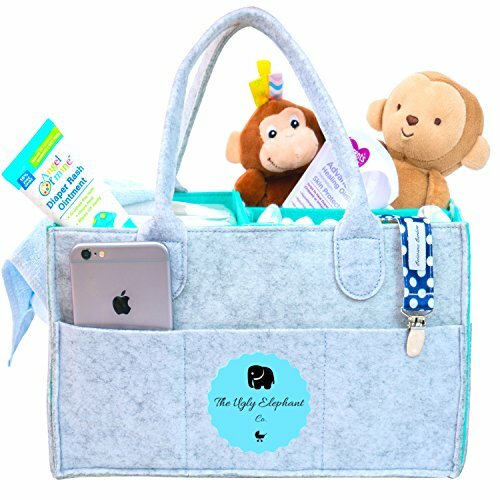 ❤ MULTI PURPOSE - From organizing the nursery room, as an baby storage caddy, nursery changing table or taking the kids to school and practice, this diaper caddy bag is perfect for all occasions and is always car friendly. ❤ FANTASTIC BABY SHOWER GIFT- Our unisex gift basket makes an perfect baby gift for newborn girls and boys and a must have for any baby shower! Have the best gift basket at the shower that everyone talks about! Also perfect for newborn gift basket for registry's! If you have any questions about this product by Ugly Elephant Co, contact us by completing and submitting the form below. If you are looking for a specif part number, please include it with your message.